Commenting on a recent post in which I noted Obama’s love for and knowledge of basketball, a knowing reader said that he was a little sick of hearing so much about Obama’s B-Ball acumen when the president’s real game is GOLF. And you know what, though Obama knows and loves hoops, he’s right. Of course, the White House doesn’t really like to emphasize Obama’s love of the links. And that’s simply because golf is for the rich people, and Obama is for the poor people. Bush loved golf too but came to feel it was not appropriate to be playing effete rich boy games while the troops were in the field. It also got him some bad PR. Remember this? 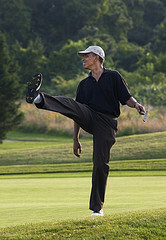 Me, I don’t care what Obama does to relax himself. If a little golf will somehow stop his hair from turning gray at its current pace, go for it. But the White House damn well cares. And it turns out there are indeed several other Upper Income Folk activities in which the Light of Hope engages. 1. Saturday morning ballet sessions with Rahm, including practicing splits and an extremely competitive pirouette contest. 3. Regular croquet matches on the South Lawn with National Economic Council Director Larry Summers and House Speaker Nancy Pelosi. 4. Smoking Dunhills and sipping expensive sherry behind in the Rose Garden while Michelle is away at some crazy “Let’s Move” deal. 6. Chess matches with the ghost of Bobby Fischer during Lincoln Bedroom séance. 7. Stamp collecting and trading with Sen. Harry Reid. 9. Daily massages administered by National Economic Council Director Larry Summers. Dont forget yukking it up while an over-the-hill rock star disrespects a past president and then waltzing off to read a few chapters of Niebuhr or some other thumbsucking mess his predecessor would never crack. Actually–does Obama read books? We haven’t gotten a condescending reading list in a while.